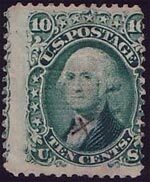 The stamp was cleaned and reperforated along its left edge. It then found a new life on the right. When one looks at the original stamp on the left and the image above, it becomes painfully clear that the stamp is seriously narrow for the issue. This is called a reperf job with the intent to make the stamp have more "eye appeal". SEE MY OTHER LOTS...ALL START AT $1 AND NO RESERVE...THIS SAYS::: unidentified grill no gum .......... Take a look at the scan. What you see is what you get. This is a handed down collection comprising of (sic) over 20 boxes. Whenever there are notations on the envelopes they will be given. Some stamps have notations on the back. 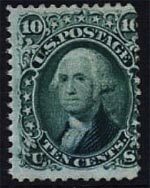 Wether (sic) these notations are correct or not is your obligation to determine which stamp/stamps this is and its' (sic) condition.